Picking locks not only requires skill, it also requires the right tools. I've bought (and tried) all the "Card Sets" out there and settled on the one that was made by the people who invented these things. These cost more, but they're worth it. Designed and produced by The Open Organisation Of Lockpickers, this ISO-compliant wallet-sized card can be kept easily on your person without hassle or fuss, but should the need arise for picks in a pinch, simply snap the card apart and you have a nine-piece toolkit at your disposal! Comes with: two feeler hooks, a half-diamond, a wavy rake, a sawtooth rake, and a double-bump rake. The 'frame' of the card snaps apart into Five tensioners. 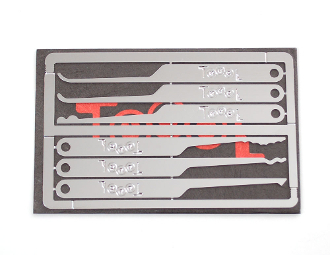 Unlike other "credit card" pick sets pop up from time to time (that tend to either be interesting novelty items or overpriced and under-equipped), this TOOOL card is a genuine and fully functional lock-pick set made in the USA from Laser Cut commercial-grade steel (not stamped aluminum or plastic) and polished to give smooth insertion and snag-free extraction for the picks. After you're done, either put the picks on your key ring or use the supplied tyvek envelope to put them back in your wallet.